Muttai kulambu is a delicious Tamil style egg curry that makes for a great side dish with chapati and rice. Those who follow my food blog regularly are aware of our family’s love for eggs. It has been a while since I posted any Indian style egg recipes. 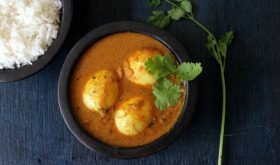 Eggs are known as muttai in Tamil language while kulambu is a thin or thick consistency gravy or curry with well-balanced flavors made with or without tamarind. Coconut is often used in most kulambu recipes. 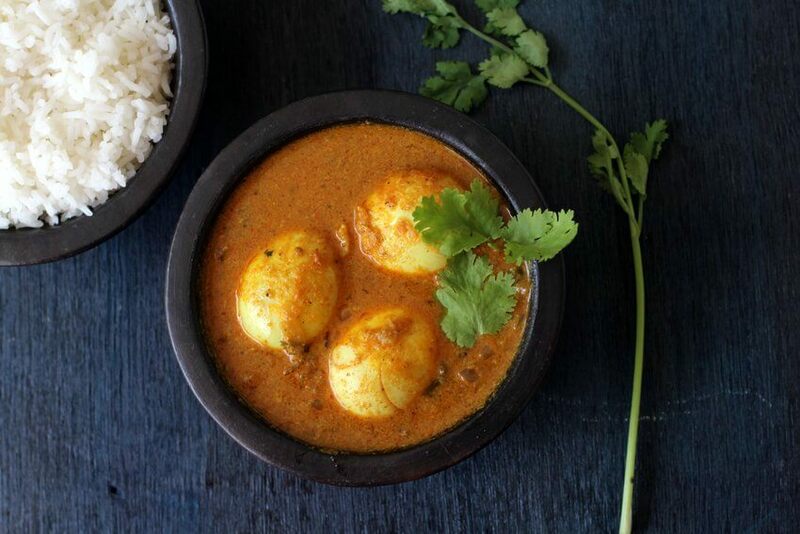 There are numerous ways you can make an egg curry and I often cook a variety of traditional, Indian regional egg recipes. In fact, I have a notebook full of handwritten family recipes that I religiously note down from family members, relatives, and friends. 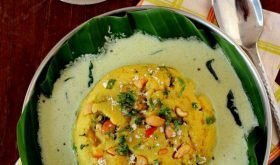 Today, I am sharing a recipe from my notes which is a regional specialty egg curry that makes for wonderful accompaniment with tiffins like dosa, vada or steamed rice, and chapati. If you are a lover of egg curry be assured you are going to relish muttai kulambu. 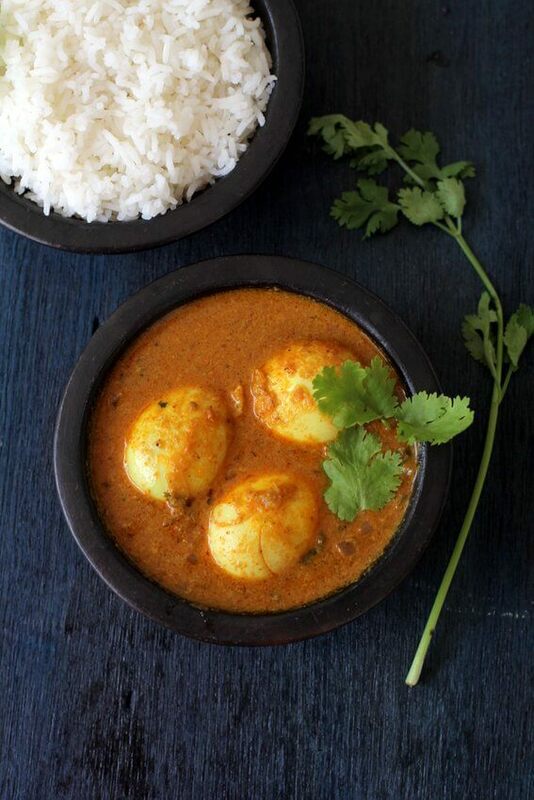 Egg kulambu is similar to Andhra style egg pulusu, a tangy, soupy egg curry made with tamarind. Most kulambu dishes call for the use of tamarind but in today’s egg kulambu recipe, there is no tamarind as tomatoes provide the required tang. 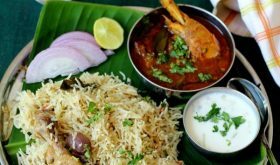 Exotic Indian spices like fennel seeds, black pepper, cardamom, cloves and cinnamon lend the dish an aroma that is enticing and an addictive flavor. Cashewnuts and coconut enhance the flavor and balance the heat from the red chilis and black pepper. This visually appealing, smooth textured egg dish can be categorized under the comfort food category especially on a rainy day when served with hot steamed rice. Soul food at its best! Do give this classic egg specialty of Tamil Nadu a try. 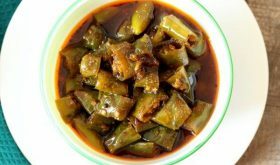 Muttai kulambu recipe takes less than 40 mins from stove to plate. Most often I like to serve this egg curry with roti or chapathi for brunch or dinner as it makes for an excellent combination. 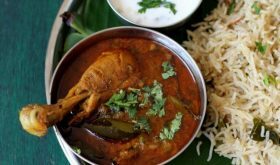 You will find similar egg curry recipes like Mangalorean egg curry, Kerala style egg curry, Andhra style egg curry, egg kurma, egg masala curry, egg slice masala, fennel flavored egg curry and more in the blog. Place the eggs in enough water and boil them. Once they are hard boiled, turn off heat and place in room temperature water for a few minutes before peeling them. Make 3 to 4 long slits around each egg and set aside. Prepare the spice paste by heating 2 tsp oil in a pan. Add cumin seeds, red chilis, fennel seeds, poppy seeds, peppercorns, cashew nuts and shallots and roast on low-medium heat for 3 mins. Add the grated coconut and roast for 2 mins and turn off heat. Cool and grind to a paste adding very little water. Heat 1/2 tbsp oil in a heavy bottomed vessel and add a pinch of turmeric powder. Add the boiled eggs and saute on medium heat tossing them around for a min. Remove from vessel and set aside. In the same vessel, add the remaining oil. Once hot, add mustard seeds and allow to splutter. Add the curry leaves and chopped onions and saute for 4 mins on medium heat. Add ginger garlic paste and saute for 4 mins. Add turmeric powder and coriander powder. Mix well and add the chopped tomatoes. Saute till oil separates, approx 5-6 mins on low-medium heat. Add 1 1/2 cups water and bring to a boil. Reduce flame, add eggs and place lid. Simmer for 7-8 mins. Add the ground paste and mix. Place lid and simmer till the gravy thickens. Add garam masala powder and mix well. Adjust salt and turn off heat. Remove to a serving bowl and garnish with chopped coriander leaves. 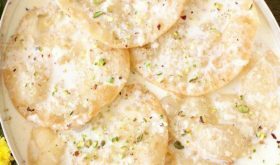 Serve with rice, chapati or tiffins like dosa. Try to use heirloom variety of tomatoes that have a pronounced tangy flavor. If you do not have poppy seeds on hand, omit it and increase cashew nuts quantity. You can use 5 cashew nuts. Dish looks mouth-watering. In the ingredients, you have mentioned Poppy Seeds but in brackets have written pottu kadalai or putnaal pappu. Can you please confirm which one is correct, esp since they are 2 different things? Thanks. I have updated the recipe. Use poppy seeds. If you do not have poppy seeds, you can use roasted chick peas. Would it be possible to make it without tomatoes? If you do not want to use tomatoes, add tamarind juice (2 tsps of concentrated juice) while the gravy is simmering. Else add lemon juice (a tbsp) once you turn off the heat. Mix well.